I fully believe that the experience of the seasons are enhanced by taste. The sight of bright orange and red leaves and the sound of them crunching beneath your feet or brushing along the road as the wind carries them along help us to know that autumn has arrived at our doorstep, bringing with her a suitcase of earlier evenings and overcast skies and pumpkins nestled together on porches. As we welcome her to stay for a few months, she whisks us into the kitchen and in a flurry of apples and squash and cinnamon and warming soups. We remember the charms of the season and hope her stay means more of that pumpkin bread. Indeed, when I think of an autumnal vegetable I think of pumpkin first, but squash is a close second. Delicata squash is an absolutely delicious addition to the table during this time of year. This recipe uses two, sliced and kept circular, roasted with some honey and herbs. I’ve also included shallots seared in hot butter with whole sage and rosemary leaves, sliced almonds, and translucent bits of shaved pecorino romano. This dish can be served as a side for poultry or meat, placed on top of cooked grains or greens, or had by itself for a light meal. If you only have the squash on hand without the accompanying ingredients of shallots and cheese and almonds, it will still be wonderfully delicious and I encourage you to experiment with your own toppings for the squash. Pecans would be a lovely replacement for the almonds, and you could use shaved parmesan in place of the pecorino romano. As long as you have honey roasted delicata playing the lead, I promise you’ll enjoy it. Slice the delicate squash in 1/2 inch circles, scooping out and discarding the seeds from the inside of each circular piece and discarding the ends. Place the sliced squash in a large mixing bowl. Roughly chop 2 out of the 3 sprigs of rosemary along with most of the sage, and add to the bowl. In a separate mixing bowl, whisk together the olive oil, honey, nutmeg, and ground cloves. Pour this mixture over the squash, and toss to coat evenly. Place the squash slices on parchment covered baking sheets, not overlapping pieces to ensure even browning. Add a pinch of salt and pepper. If any honey-olive oil liquid remains in the mixing bowl, brush it onto the squash before popping the baking sheets in the oven. Roast the squash for 20 minutes, flip the pieces and rotate the trays, then return to the oven for another 15 to 20 minutes or until golden. While the squash is roasting, sear the shallots. Melt the butter in a skillet over medium heat. While the butter is heating, slice the shallots into quarters. Place the sliced side down into the hot skillet, and add the rest of the sage leaves and the whole leaves of the third rosemary sprig. Toast until the butter is golden and the edges of the shallots are browned, then turn the heat to low and keep warm until the squash is done. 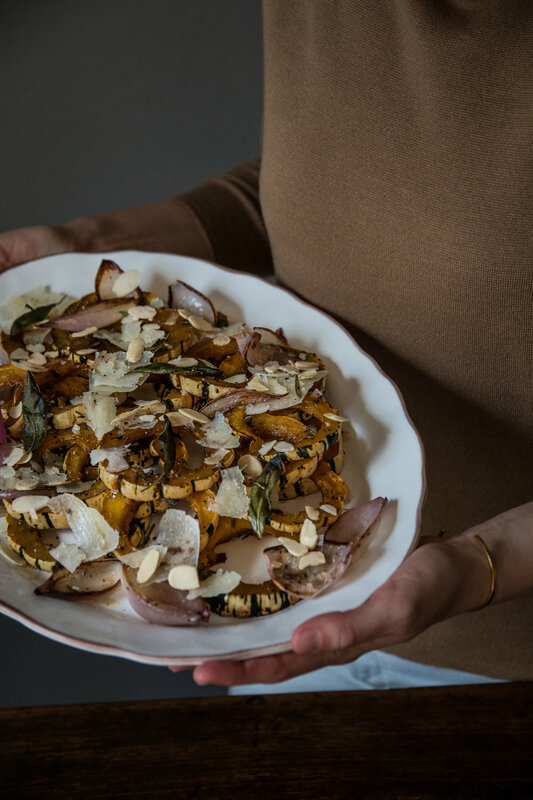 Plate the squash with the shallots and herbs along with shaved pecorino romano, slivered almonds, and a bit more salt and pepper to top it all off.